Women brought voting stickers and flowers to the gravesite after the primary. One hundred and forty-four years ago, a woman named Susan B. Anthony was arrested for voting in a presidential election. Today, millions of women will cast their vote for Hillary Clinton -- the first female presidential nominee for a major political party. Anthony's home city of Rochester, New York, is honoring her role in the movement for women's right to vote. 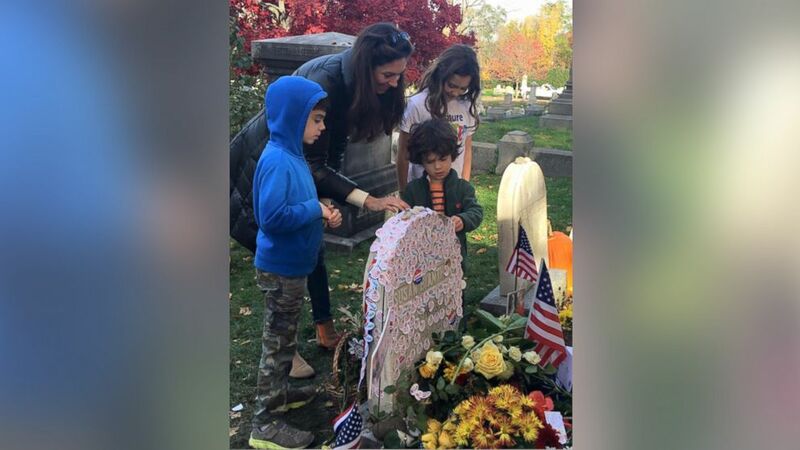 It has become a bit of a tradition in Rochester to place "I Voted" stickers on Anthony's grave, but this year's turnout is unprecedented given the historic nature of the election. The City of Rochester posted on Facebook that thousands have already gathered at the site. 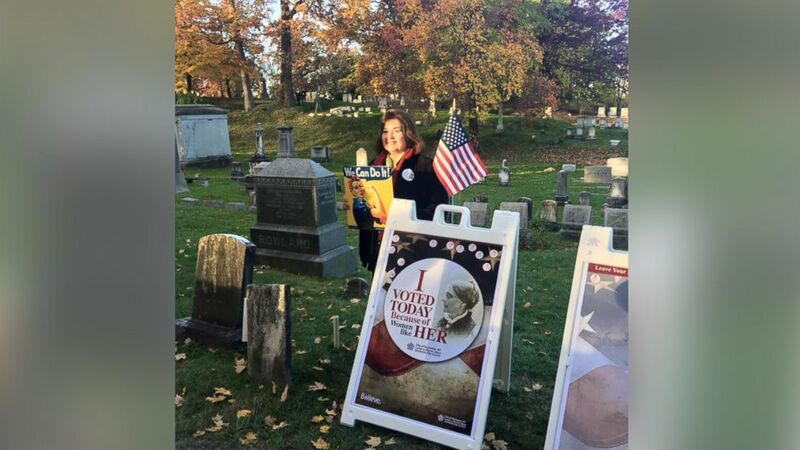 Mount Hope Cemetery is open until 9 p.m. so last-minute voters can still stop by to add their "I Voted" stickers, as well as special stickers made by the city that read, "#BecauseOfWomenLikeHER," on Anthony's grave. (City of Rochester, NY) The City of Rochester Mayor's office says thousands of people made their way to Susan B. Anthony's grave to honor the late suffragette. Dozens of women visited the suffragette's grave to leave flowers or their "I Voted" stickers when Hillary Clinton became the Democratic nominee earlier this year. Some women, such as Elissa Blattman and her mother, visited Anthony's grave after early voting. 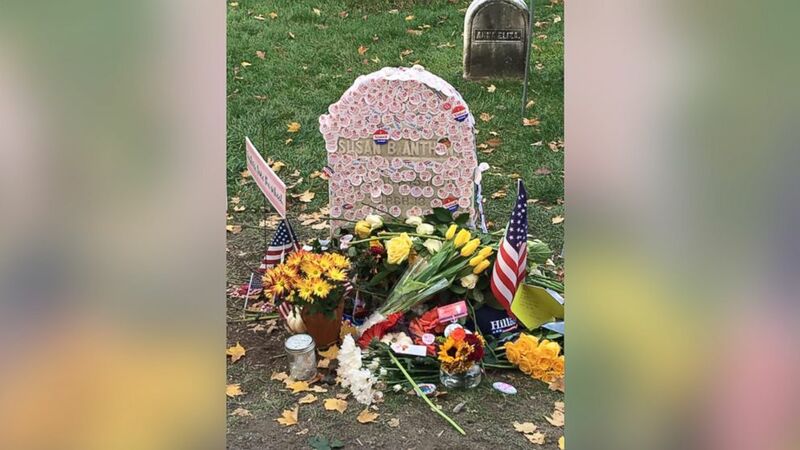 "Ever since I first found out about people putting their 'I Voted' stickers on Susan B. Anthony’s grave, it has been on my bucket list to do the same," Blattman told ABC News. So she and her mother drove more than 350 miles from Rockville, Maryland, to Rochester, New York, to honor the iconic feminist. "Words cannot express how glad I am that I got to pay tribute to her in this way, using the sticker I received after voting for the potential first woman president," she said. Deborah Roberts, director of the Susan B. Anthony Historic House and Museum, said people have also mailed in their stickers to honor Anthony. She said the museum will keep the stickers as part of the collection, as well as signs put up by the city for people to write messages to Anthony. Suein Oh contributed to this report.